Mount Gilead’s Holly Gompf puts up a long shot attempt against the defense of Galion’s Gabby Kaple on Monday night. MG won the game by a 44-39 margin thanks to a big fourth quarter. Strong defense and some timely late scoring propelled the Mount Gilead Lady Indians to a season-opening 44-39 home win against Galion Monday night. The Indians played their guests to a 22-22 tie after three quarters of play, but were able to match that output over the final eight minutes to claim the win. Mount Gilead opened the game with strong defense, forcing Tiger turnovers on Galion’s first three possessions. However, despite three points from Dakota Shipman and two each from Holly Gompf, Alexis McCoy and Izzy Schroeter, the team still only led 9-7 after eight minutes of action. That two-point lead held going into the half, as both squads could only tally five points in the second quarter. However, with his team’s top returning scorer, Madison Fitzpatrick, on the bench for much of the first half with two fouls, Stover was pleased his team was still able to hold a lead. Obviously one of those ways was defensively, considering the Tigers only had 12 points through 16 minutes of action. Morgan Kimble and Gabby Kaple both scored four points in the first five minutes of the third quarter to put Galion up 20-16, but MG recovered, getting basket from Samantha Sullivan and a put-back by Shipman after a missed free throw to tie the score. Kimble scored again to regain the lead for the Tigers, but a Fitzpatrick basket to end the period tied things up going into the final quarter. Trailing 25-23 early in the quarter, Mount Gilead got a big boost from their defense. After a Gompf three-pointer put the Indians back and front, the team got steals from both Zoie Barron and Gompf that both girls converted into lay-ups. Gompf also was fouled on hers, with a successful free throw giving her team a 31-25 lead. After the two teams traded baskets, Gompf scored four more for MG, putting them up by a 37-29 margin with 3:37 remaining on the clock. However, the Tigers would make a run to get right back into the contest. Trailing 37-31, they got four straight points from Kaple to only trail 37-35 with 2:12 to play. 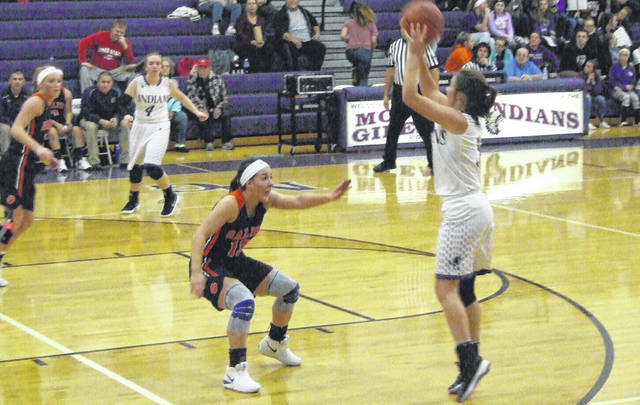 Mount Gilead’s defense would preserve the win, though, as they didn’t give up much more offense to the Tigers, who only were able to score on a pair of free throws by Heaven Phelps and a late Kaple shot down the stretch. MG would get shots from Shipman and Gompf and three Schroeter free throws to pull away for the win. Gompf led the team with 19 points, while Shipman added eight. For Galion, Kaple tallied 17 and Kimble finished with eight.